For our last outing we take a boat from Doolin to one of the Aran islands, Inisheer. Hey, I didn’t realize the Cliffs of Moher were visible from the Doolin harbor! Cool. Inisheer is the smallest but closest of the Aran Islands. Inishmore, the bigger, more touristy Aran island, has the blockbuster sights, such as a 2,000-year-0ld Iron Age stone fort perched on the edge of a cliff, but it’s a lot further away. Inisheer has its own interesting sights. All of these islands are harsh, steep, rugged, rocky and windswept by severe gales – like the Blasket Islands, only these are still inhabited. The gritty population lives off a mean sea and a land with less than 6 inches of topsoil. Little of the land can be farmed. 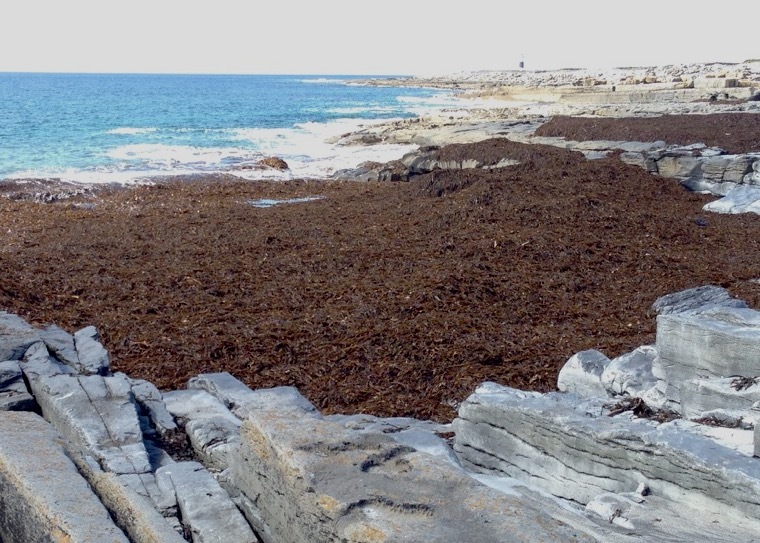 The soil that exists was mostly created by the islanders themselves, the results of centuries of layering gathered seaweed (the brown stuff in the picture) with limestone sand and animal dung. What we see as we approach Inisheer is the incredible number of stone fences that apparently needed to be built to clear the land. It’s a staggering amount of stone! As we dock we are greeted by a lone dolphin, happy to see us! Inisheer island looks a lot like the karst landscape of The Burren, with criss-crossed grikes everywhere, often with flowers sprouting from the cracks. Clearing this stuff must have been incredibly hard. The many stone walls on the Aran Islands are often built in a unique style, I think due to the small plots that they enclose. 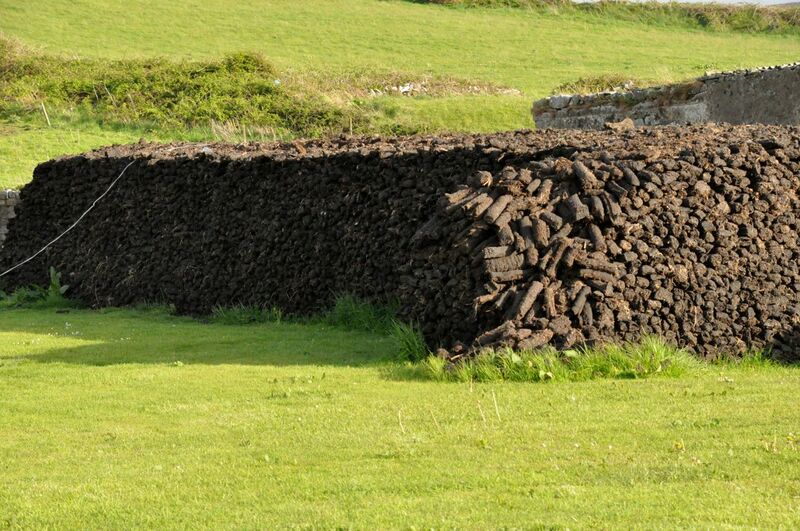 In this “Aran ‘gap’ style”, the walls periodically include tall upright stones, the spaces between them filled with smaller stones. This construction allows a farmer who wants to move livestock to dismantle a short section of wall as a temporary gate, and then easily rebuild it. It also allows the winter gale winds to blow through the gaps in the wall, rather than blow the wall over. 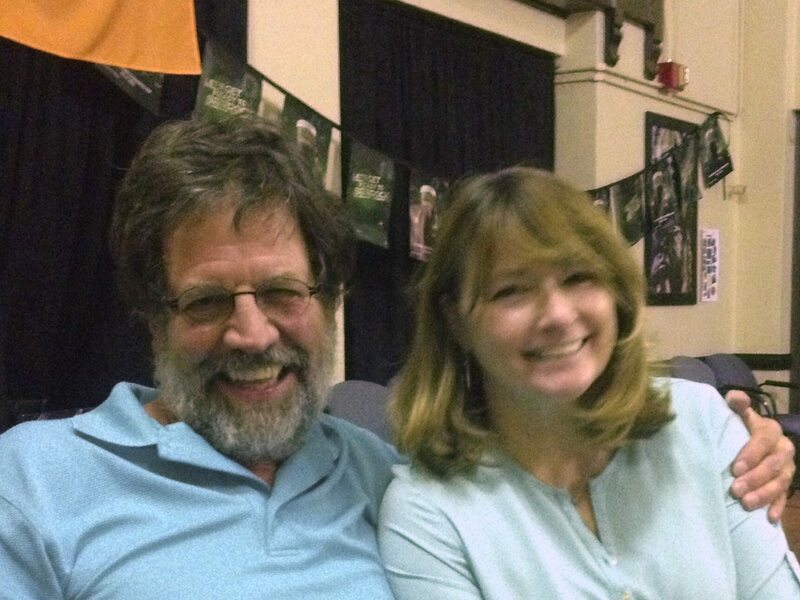 gale a few weeks later. has a carved stone above it. Nearby is the reputed gravesite of St. Caomhan. Local folklore claims that if you spend the night sleeping on the tomb, your particular illness will be cured (my guess is that sleeping there would be sufficiently uncomfortable that afterwards other parts hurt worse). in 1652, leaving the ruins seen today. with the stones than carry those suckers down to the beach. On the way back to Doolin we get an up-close view of the Cliffs of Moher from the sea. I can’t identify – the picture above, on the right, shows two unidentified black birds defending their nest. hunting for dinner with the other birds. Beautiful! Ah – that last picture, from the internet, is just to show you how spectacular they really are. And so the Ireland/music tour winds down. I’d like to share one last set of pictures with you, of Irish crosses mostly from Skibbereen and Inishmore. The Irish cross is beautiful, full of Celtic artwork. and Irish pipes (!! ); she also sang ballads with the voice of an angel. songwriting skill. Len, along with several others in our group, had suffered through a debilitating stomach bug early in the tour. His song, “There was a salad in (name of restaurant)”, sung to the tune of “House of the Rising Sun”, was a show stopper. And of course the Small Potatoes performed, also a great treat! some wonderful people who were soooooooo knowledgeable about music. The picture on the right shows us all, on the last day before leaving. As noted in the first post of our Ireland tour, we’re out of sync with our travels. We interrupted our posts about our travels in bonny Scotland to write and share this section on Ireland with our new-found tour friends. The next post will cover our last two days in Ireland. We visited Bunratty Castle and Limerick with two good friends from Ohio who went on the Ireland tour with us. After that we’ll pick up where we left off in beautiful Scotland. had to face! First there was need to clear the rocky land, and the stone fences are monuments to that effort, a physical “tip of the hat – you’re welcome” from the ancestors. Then there was the law requiring the land to be subdivided for each male child; before the famine each little plot would have had a house and a family on it. 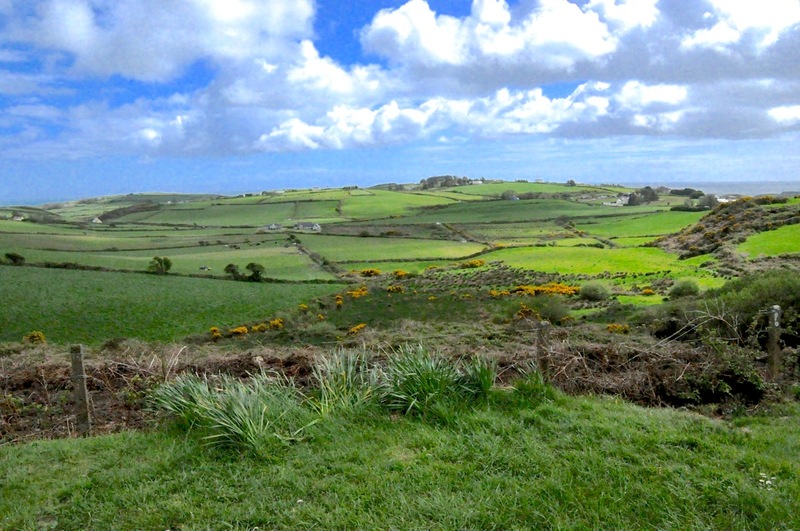 Before the famine of 1845 there were 40,000 people on this peninsula. Even today it’s home to just 10,000. 8, 2015). This harsh yet starkly beautiful area was the setting for two period films of note, Far and Away (Cruise, Kidman) and Ryan’s Daughter (Mitchum, Miles). was home to 160 people, over time it dwindled to 22. In 1953 the government moved them to the mainland, and today the island is uninhabited. The next day is a mostly free (collapse) day, and I and 2 others decide to hike from Ballyferriter to the nearby beach at Smerwick Harbor. It’s a gorgeous bay, but expansive – and difficult to capture in a single photo. My only picture of a good portion of the bay comes from a shot out our hotel window over the roofs across the street – not ideal, and not all of the bay, but you get the idea. Here in Ireland every place seems to have some history associated with it. When Catholic Ireland once again took up arms against Protestant England (this time Queen Elizabeth I) in 1580, a force of 600 Italian and Spanish troops sent by the Pope to aid the rebellion surrendered to the English at this bay – and were promptly massacred. Our hike will hopefully be less newsworthy, but it is windy! The bay is full of whitecaps, and when the waves break in a timed sequence along their front, streamers of mist are blown in the air in an enchanting linear choreography. Tommy O’Sullivan, the pub owner, is playing the guitar. I’m not a big fan of accordion music, but Brendon made me change my mind. He was fabulous, and knees were bouncing all over the room. Back at Ballyferriter, we’re treated to a bit of a sunset on this ever-cloudy isle. is absolutely raging, beautifully so. As we travel on, we see another ruined tower house, and then the ruins of a castle-estate; they’re everywhere! A few miles away is the ruin of Leamaneh Castle with an interesting history (and a tie-in with our destination, the Cliffs of Moher). 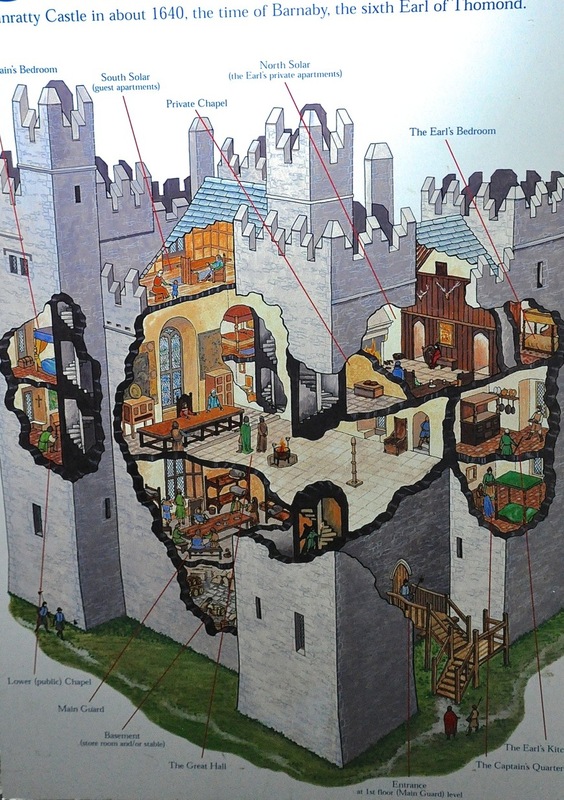 The castle was originally a 5-story defensive tower house, built around 1480 by the reigning King of Thomond, scion of the O’Brien family – and a direct descendent of Brian Boru (Boru is considered to be the greatest of the ancient Irish kings; in 1002 he united Ireland for a decade). You can still see the outlines of that tower house on the right side of Leamaneh Castle in the pictures below. One of the grandsons who inherited this O’Brien stronghold was hung for fighting against the English, and the tower went to one of his grandsons, who married the newly widowed, and newly rich, flaming-red-haired Maire McMahon in 1639. They had 8 children, and around 1648 they expanded the tower into a comfortable 4-story mansion. Maire accompanied her husband on raids against English settlers, but in 1651 he was mortally wounded fighting Cromwell’s English army. Maire, realizing that the punishment for rebellion would be the forfeiture of their property, married a Cromwellian soldier and thus retained her estates. Where there’s a will …. And now, the Cliffs of Moher. The name Moher comes from the old Irish word for “ruined fort”; a 1st Century BC fort stood here until the 1800’s. 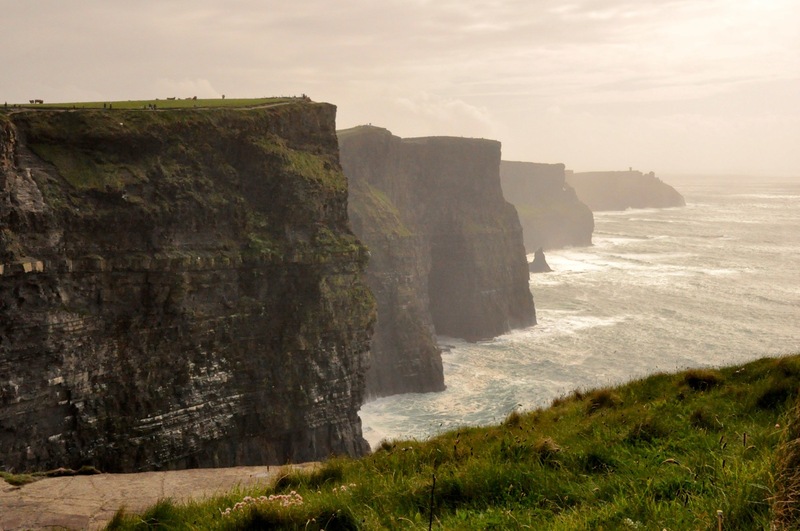 The cliffs are 700 feet at their highest, and stretch for 5 miles. 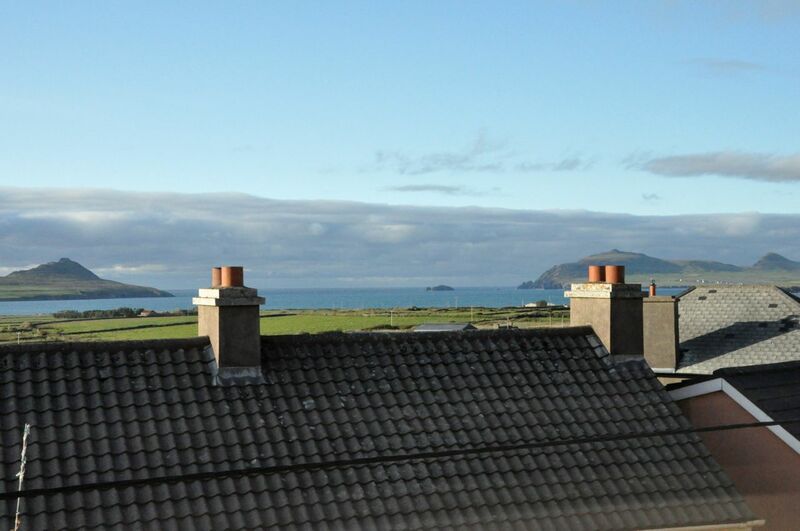 On a clear day you can see all the way to the Blasket Islands in the adjacent (but way further south) Dingle Peninsula – but not today! It’s threatening rain and incredibly windy. But still so very beautiful! the fierce wind is getting ever stronger, and the temperature is dropping. We make a run for the bus and hop in just as the deluge hits. Good timing! Sorry about the long post, but hope you enjoyed the pictures. 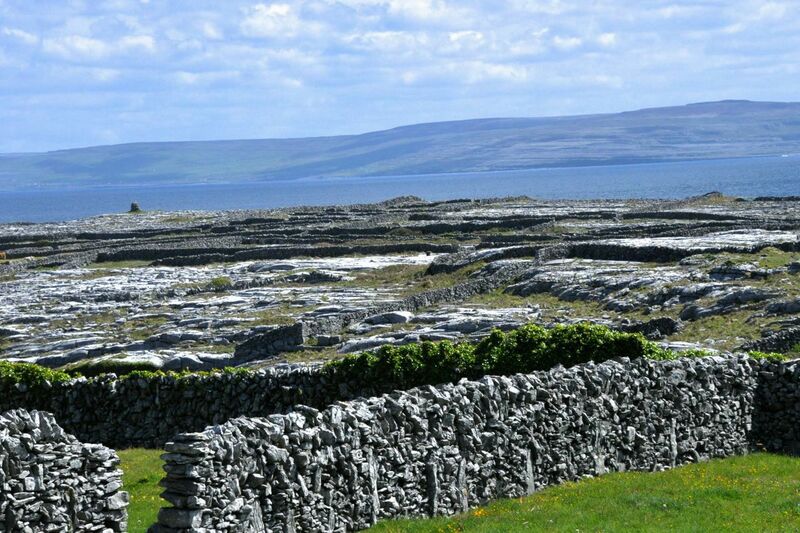 Next post: The Burren, and a 5,000 year-old tomb. 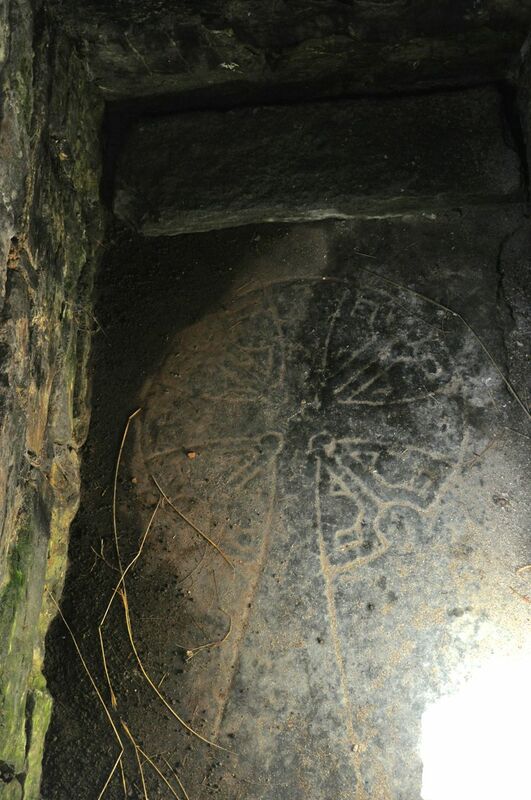 most impressive (it’s almost 6′ tall), called the Reask Stone, is decorated with an encircled, equal-arm cross, below which are spiral designs. On the left side, inscribed vertically, are the initials DNE (the “D” looks like “d” to me), short for the Latin Domine (“Lord”). Some other inscribed stones with crosses are shown above. The early beginnings of Christianity were certainly a far cry from the magnificent stone Catholic cathedrals that were to come 7 or so centuries later!! Also found at the site were pieces of Roman amphorae that would have held wine, and a kiln for drying grain and corn – for the monks themselves, and for the locals for a 10% tithe. After the site was abandoned, the area around the oratory was used as a children’s burial ground. Pictures of the walls of the oratory and a conjoined hut are shown below. We’re now off to the nearby Gallarus Oratory, but first we pass an Irish “fort”. It is not impressive! These forts, or ringforts, date from the late Iron Age (~500 BC) to early Christian times. They’re simply a circular earth bank with ditches in front, sometimes topped with wooden palisades; thatch or wooden dwellings would have been located in the center. The forts survived untouched over the centuries because they were believed to be “fairy forts” imbued with Druid magic; it was safer not to disturb them. door had two projecting stones with holes, which once held a door. A carved stone marker is also nearby, shown above. 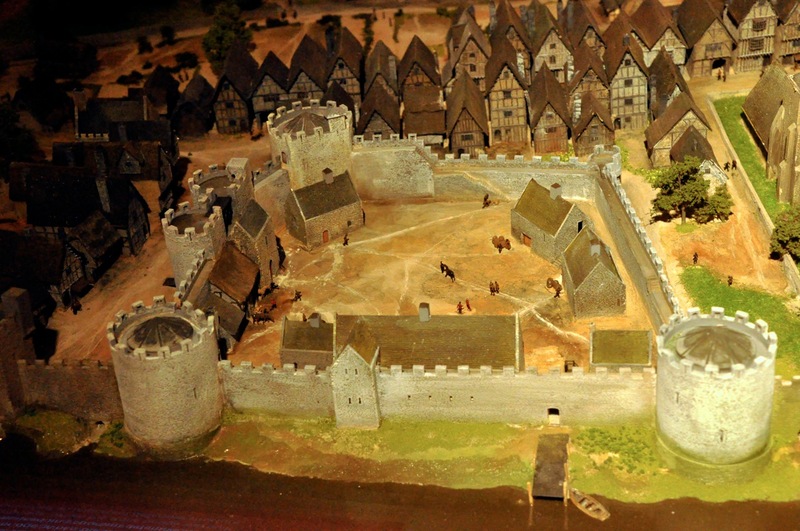 Like most of Ireland, the area suffered from attacks by successive invaders. Vikings and Anglo-Normans burned, pillaged and destroyed the settlements around Gallarus and the oratory was abandoned. carved with the Latin alphabet, the letters DNI (representing Domini), and a small cross. There is a nice little video of this church at this link, “Romanesque Church in the Dingle“. Outside the church, a densely populated graveyard holds a large-stone early Christian cross, a much older ogham stone, and an early sundial. 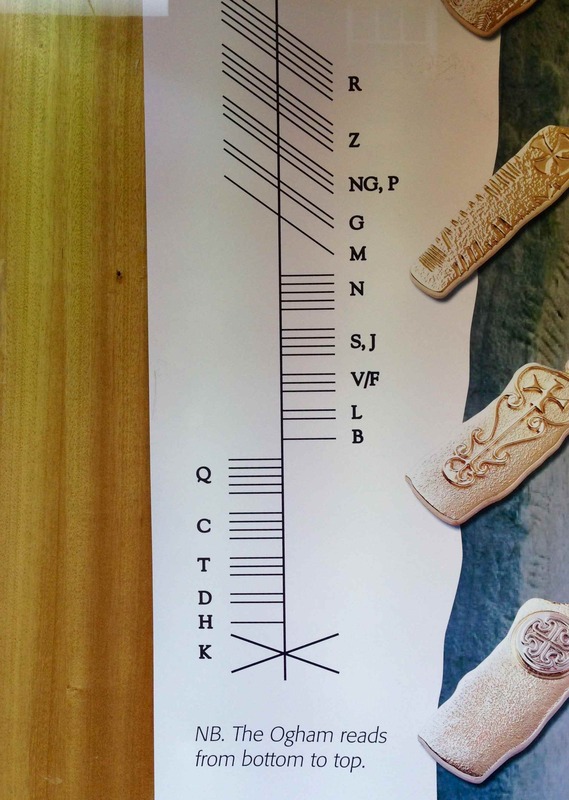 The ogham stone is fascinating. It had already stood there for 900 years when the church was built. 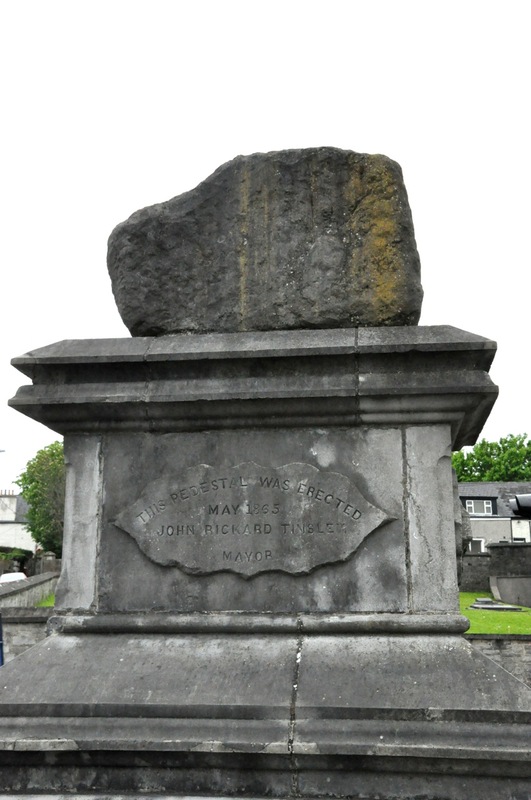 Those slash marks on the side of the stone are Morse-code-like letters from an early Irish language (Primitive Irish) used from 200 – 600 AD. The picture to the left shows some of the marks and their English alphabet equivalents. This stone marked a pre-Christian grave. About 400 of these stones survive in Ireland and Wales. There are several theories about who created the language: either (1) Irish scholars to provide a secret means of communication in opposition to the authorities of Roman Britain (who would know Latin), or (2) the early Christian communities in Ireland who wanted to write short messages and inscriptions but found the sounds of Primitive Irish too difficult to transcribe into Latin, thus requiring a unique alphabet. 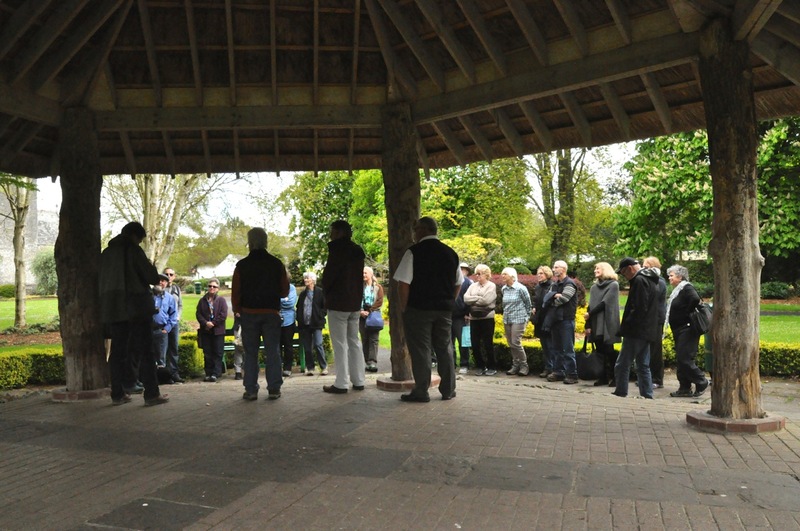 to measure the time of day … in the graveyard … on a rare sunny day …. Perhaps it was a way to know when a church service would begin? It may be somewhat odd, but it is still an amazing relic of the long ago past. From here we’re off to see some scenery, so this is a good time to close this post. In the next post we’ll drive to the coast at Slea Head, the westernmost part not only of the Dingle Peninsula but Ireland itself. Then we’re off to County Clare to visit the famous Cliffs of Moher! Head Visitor Center. Historically, Mizen head was important because transatlantic shipping routes passed nearby and ships had to contend with treacherous offshore rocks – “offshore rocks” may not sound very scary, but we’re talking jagged pinnacles, some jutting up 100 ft, lying 6 or more miles out and surrounded by deep water – not a friend to shipping! 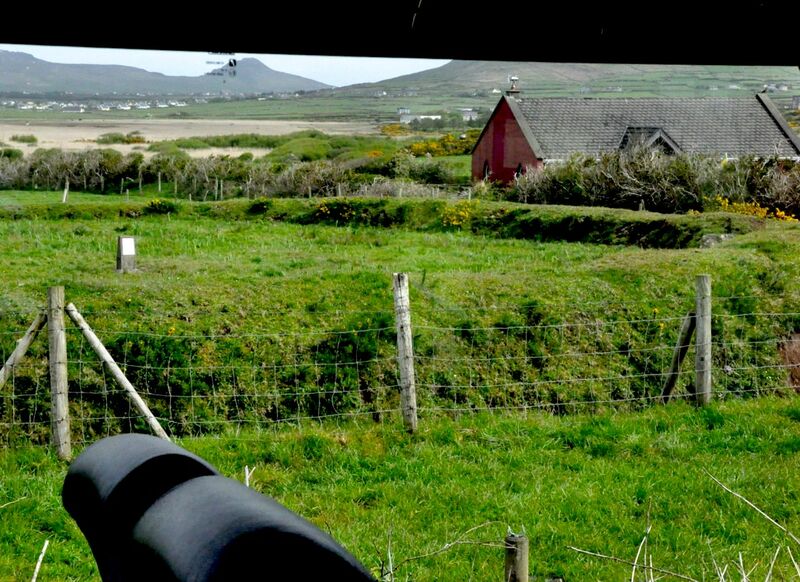 The Mizen Head Signal Station, those white buildings clinging desperately to the headland crest, was once permanently manned; now it’s a museum with displays relating to the site’s strategic significance for transatlantic shipping and communications, including Marconi’s pioneering development of wireless (radio wave) communication at the turn of the century. 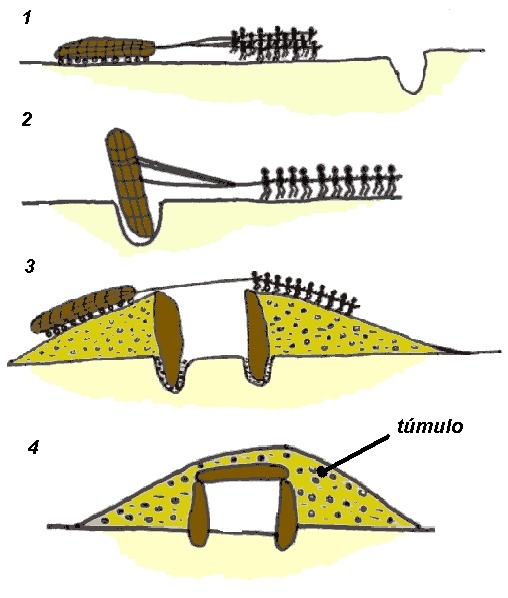 dovetailed interlocking stones to create a single monolithic structure that could withstand the wild Atlantic weather (see diagram above). Not long after it was built, Marconi fastened aerials to it to help prove that transatlantic messaging would work. The lighthouse is still going strong after 115 years. 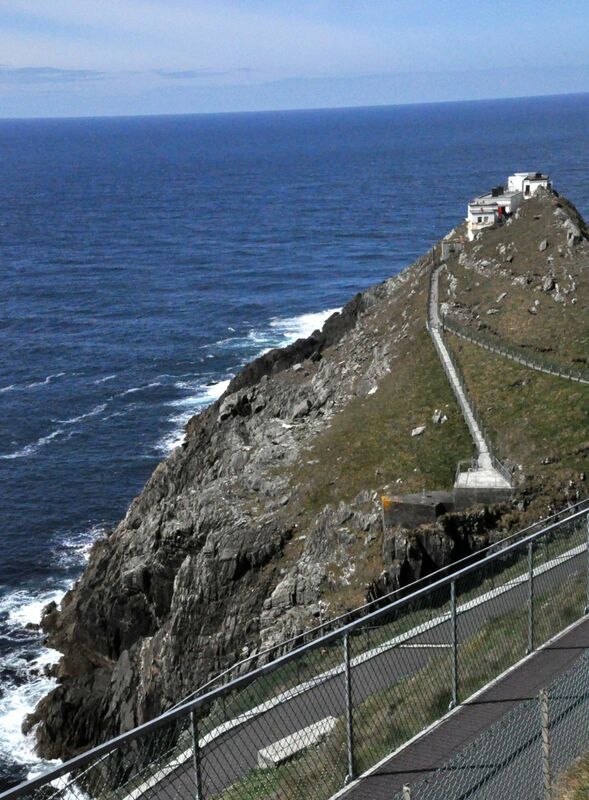 Mizen Head is beautiful, a place of pounding surf and rocky cliffs diving into the sea. Exploring here is also great exercise – the paths are either a steep up or a steep down. There’s a cool bridge on the way to the signal station, the rock is gorgeous, and the views impressive. Whales and dolphins are sometimes sighted here, but not today. steeply down down down down down to a good view. But the bus is about to leave! So I have to run down, snap a couple of quick photos, and (OMG) run back up, and up, and (wheeze) up and (WHEEZE) up; you’d better enjoy those pictures! suggesting this hard life nevertheless had some pretty nice perks. Lunch at the water’s edge is crab again (yum), and a pint of hard-earned Murphy’s; the view isn’t bad either! Those are signal towers in the left image above, a system of in-line-of-sight signal towers built by the English to warn if Napoleon was coming by sea (he never came). again from where it stops. There is a predetermined course, and somewhat like golf the winner is the one who takes the fewest throws to cross the finish line. A professional bowler showed us how it’s done – the ball went way down the road to where those “catchers” are waiting – and then a bunch of us took turns trying our hand (the catchers moved closer). Based on our results, we need more practice before we form America’s Team. through music that he researches and resurrects. His second Irish language album, Irish Songs We Learned at School, sold double platinum. Micheal Murphy, there in the center of the right picture, has a beautiful voice and also did his best to teach the group an Irish line dance. Luckily no one was seriously injured. Thanks for the two pictures, Len! The next day we’re off to County Kerry and the Dingle Peninsula. 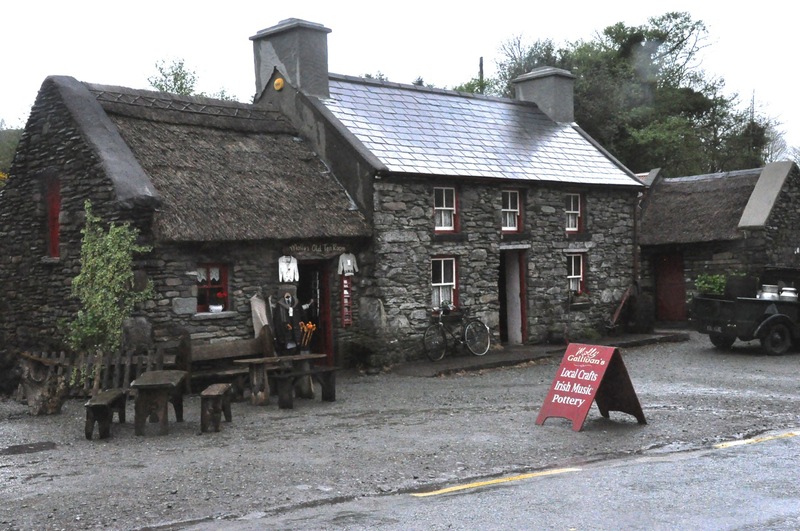 First stop is Molly Gallivan’s cottage and farm museum that’s near the top of a mountain pass. Molly’s Cottage is over 200 years old. The single story thatched roof section on the left of the picture is original; the right side of the building was raised and a slate roof added in the early 1900’s. 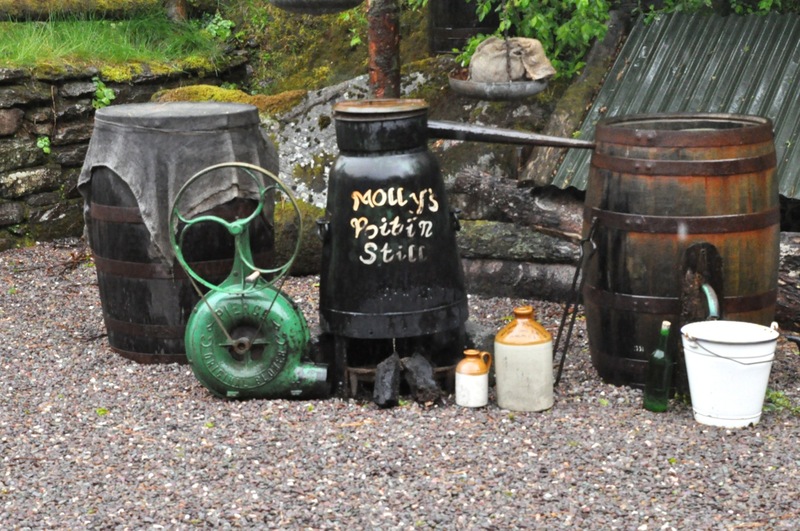 The museum provides a good insight into the simple country life of rural Ireland in the 1800’s. Alas, it’s raining so hard that we have to forgo the farm tour, but there is a video that’s still quite interesting. Molly was widowed with seven small children and had to make the farm support them. Which she did with incredible industry! She sold some of her farm produce on the local market, along with baked goods and hand-spun woolens. What really helped, however, was her illicit home-brewed poitin (whiskey); it’s still being made, I might add, and is available for purchase. 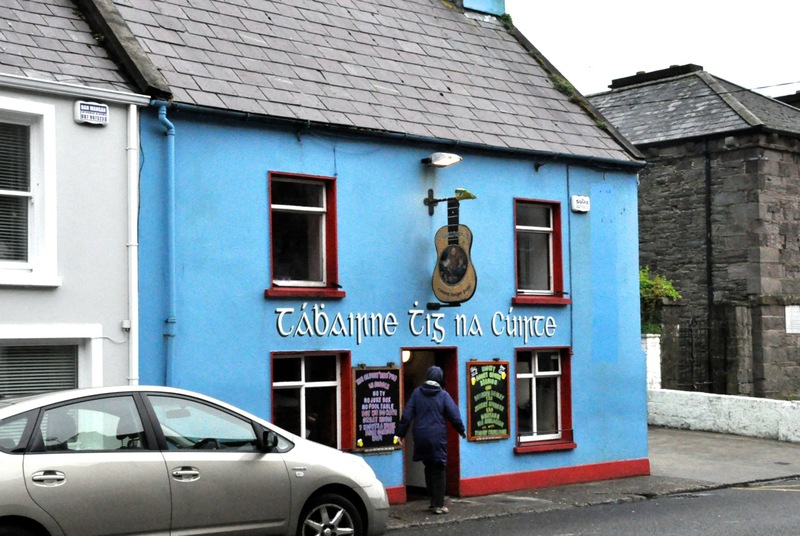 Dingle Peninsula and its small-town-charming Dingle, famous for its traditional music pubs. 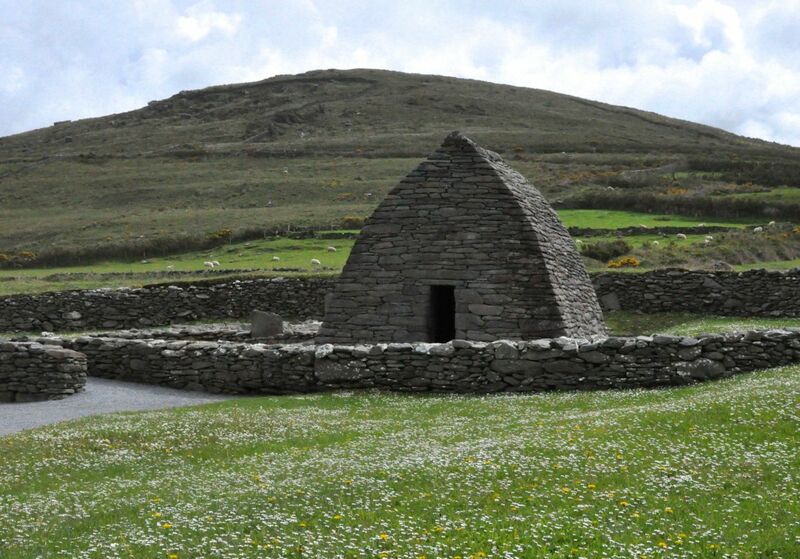 Next post – visit to some ancient early-Christian sites, the fabulous Gallarus Oratory and Kilmakedar Church.